+ William Dyrness, professor of theology and culture, in his book The Earth Is God’s: A Theology of American Culture. Responding to “our particular lived situation” informs Fuller’s classes on campus and at immersion courses at such cultural sites as New York City. 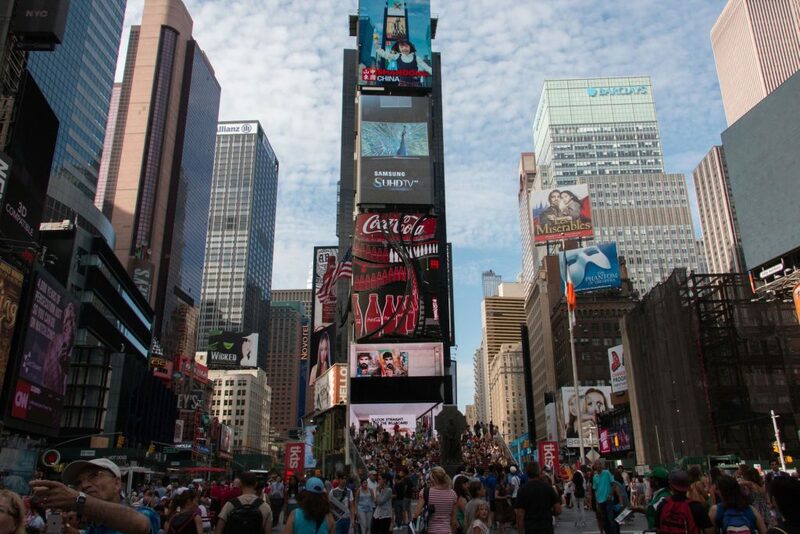 Interpreting the many messages of Times Square (pictured above, from the New York City immersion course) is not unlike interpreting popular culture—messages to engage both theologically and practically. Learn more about Fuller’s immersion courses here. + Robert K. Johnston, professor of theology and culture and director of the Brehm Center’s Reel Spirituality film initiative, from his book God’s Wider Presence: Reconsidering General Revelation. 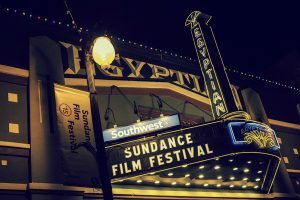 Above: a scene from Fuller’s immersion course at the Sundance Film Festival. Learn more about immersion courses here. + Barbara Buck, associate pastor at St. Peter’s by the Sea Presbyterian Church, joined the Brehm Center’s immersion course at the South by Southwest Music Festival. Learn more about this immersion course here. + Barry Taylor, the Brehm Center’s Artist-in-Residence, in his book Entertainment Theology: New-Edge Spirituality in a Digital Democracy. Pictured: Taylor spray paints a graffiti art installation at the music and technology festival South by Southwest. Voices from the Fuller community in this section engage popular culture as a “site for the exchange of ideas” from a variety of perspectives. “As the recent controversy of France’s relationship with Muslim head-coverings has demonstrated, fashion is the carrier of deeply political, social and religious intertextuality. For theologians to detach themselves from an awareness of the symbolic power and cultural import of this multibillion-dollar industry is to develop a language game removed from the real world.” + Robert Covolo [PhD student], from an essay on the theology of fashion, available here. “In video matters, the children of light must be skilled. Since TV will remain a mixture of good and evil until the end of time, the righteous must dig in for a long struggle. . . . Therefore, in all TV interests, one must cultivate a wholesome tension. An optimism about the righteousness of the cause ought always to be tempered with a pessimism of redeeming history through such a means. Any state other than inner frustration may lead to either left or right wing extremes. These are critical times.” + Edward Carnell, Fuller’s second president (1954–1959), in his book Television: Slave or Master?, a reflection on engaging media—written long before the Internet—that continues to reflect Fuller’s approach to culture today. “Many types of nonmodern forms of worship—be they contemplative or meditative; featuring drums, Celtic, or Taizé music; with candles, food, or showing digital media—are embraced in post Christendom churches. God created all of reality, and the task of the people of God, as God’s agents, is to offer all of reality back to him in worship.” + Ryan Bolger, associate professor of church in contemporary culture, in his book The Gospel after Christendom: New Voices, New Cultures, New Expressions. “Humans are amazing in their ability to be challenged and face obstacles and rise above them. But the consequence can be that as you experience this excitement and realize that you’re excelling, as people pat you on the back and praise you, you can start to trick yourself into thinking that ‘I am worth something when I perform. I am worth something when I win, and I’m only worth something when I perform and I win.’” + Ben Houltberg, associate professor of human development, in a lecture to athletes about negotiating performance-based identity. “Unlike Han Solo, who is looking to leave the rebels and cowers from leadership in an effort to save himself, Luke is eagerly and courageously reborn into a time when the galaxy desperately needs the possibility of what he can become. . . . In this time of rampant egocentrism, in the midst of desperate need and with the world waiting for us to be born, may we act upon the power and command of our spiritual rebirth, may we be born for others and may we be born into action.” + Roslyn Hernandez [MDiv student], writing for Think Christian on Star Wars and Walter Brueggemann’s theology of justice. “Many hip-hop artists are searching for a God that thinks like they think, that walks like they walk. But a God that smokes like we smoke? You want a blunt-smoking Jesus? That is not a theology—that is the catechism of the irreverent. Still, within that irreverency is something deeper at work. This is an attempt to make God more accessible to those who have been oppressed and who have only seen one symbol of who Jesus is. Hip-hop says, ‘we’re gonna find this element, and we’re going to do so on our own grounds.’” + Daniel White Hodge [PhD ’07], in an interview with Brehm Center Program Director Nate Risdon, available here. “There has been an abundance of research examining video games as a potential cause of antisocial or violent behaviors. But is the opposite also true? Is it possible that video games can be a gateway to positive moral transformations and enhanced spiritual consciousness? What are some ways we might go about measuring and assessing gameplay effects on moral development?” + Ryan Hornbeck, a postdoctoral researcher with the School of Psychology’s Thrive Center, from his ethnography of players in World of Warcraft, an online video game. Watch his presentation here. “A deep theology of Love needs a new fresh articulation in our time in a similar way that Jürgen Moltmann renewed a generation’s call to find anew a theology of Hope. What artists like Macklemore are doing is what the early followers of God did: looked in the hedgerows and alleyways for those who want to come to the banqueting table and offer them a seat.” + Jeff Keuss, writing for Christ & Cascadia, on the role of rap artist Macklemore in prophetically naming injustices in the world. “Cultural ‘texts’ function religiously, so it is important to consider the extent to which this is the case. If we add the fact that culture lays in the background of faith commitment more than is realized, then the boundaries between religion and culture become incredibly blurred. Pop culture [like superheroes] is so often transformative for people, eliciting emotional responses on par with those elicited by religious music or sermons or spiritually intense moments.” + Anthony Mills [PhD ’11], on the blog PopTheology.com. Read more in his book American Theology, Superhero Comics, and Cinema: The Marvel of Stan Lee and the Revolution of a Genre. “Celebrity culture hurts both the celebrity and the crowd. It dehumanizes the celebrity into a consumable good instead of a fellow human being, and it strips the crowd of the dignity to think for ourselves since loyalty to a brand demands the crowd to consume the product without discretion. I lament that we are entangled in this web that weaves faithful Christian living and celebrity culture.” + Alum Cindy Brandt [MAT ’03], reflecting on the negative effects of celebrity culture. Read more here. “Beer is a wonderful catalyst towards community. I’d even argue that beer shows us something of God’s intentions for us. This is especially relevant for those of us in Cascadia. The brewing and drinking of high quality beer (and wine and liquor) has seeped into the culture of Cascadia. Our love for fine drinks, and the celebration that accompanies them, give us a grand glimpse of the wedding feast in the world to come, the celebration of Christ and his bride, the church.” + David Arinder, writing for Christ & Cascadia, on the eschatological significance of craft beer culture in the Pacific Northwest. “Sunday evening at the CenturyLink field is the largest and most significant liturgical event in the life of Seattle. . . . The stadium experience appears to indicate that Cascadians long to worship and that they long for community and connection. They long for stories and heroes, songs and rituals. They long to raise their hands, hearts, and voices. They long to be a part of some larger story, some larger experience, relationship, or spectacle.” + Matthew Kaemingk, director of the Fuller Institute for Theology and Northwest Culture, on fan culture and the Seattle Seahawks. Read more here. + Graphic novelist Gene Luen Yang (quoted above), keynote speaker at the Asian American Center’s Altered Egos Conference, spoke on American comics, Asian stereotypes, and the importance of representation. Rather than choosing one culture or the other, Yang suggests a balanced approach he ultimately finds in Christ himself. Watch his lecture and more here. 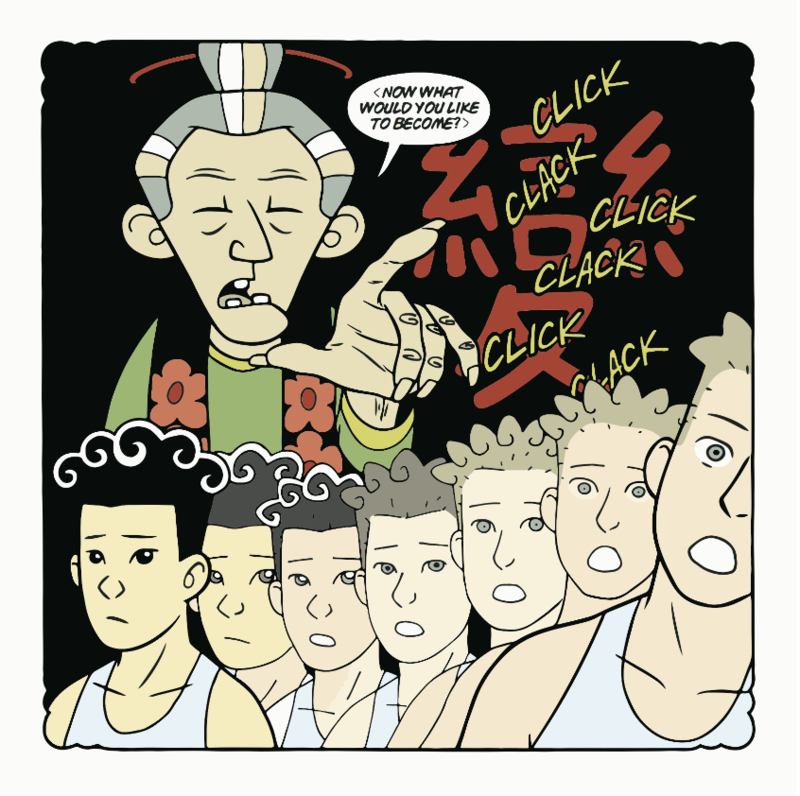 Pictured above: an image from his award-winning graphic novel American Born Chinese. + The Altered Egos Conference, a two-day event put on by Fuller’s Asian American Center, gathered culture-makers, artists, and writers to consider the importance of representation in pop culture and Asian American identity. 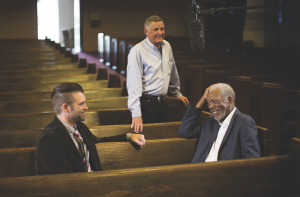 Program Director Daniel Lee (pictured left) reflected: “It’s a common theological fallacy to think that our Christian identities replace our racial/ethnic identities as though we can be some neutral abstract persons in Christ. When this misunderstanding is abetted by the lack of representation and misrepresentation of Asian Americans in pop culture, it can lead to many Asian Americans hiding the ‘Asian’ parts of their identity. Asian Americanness becomes their hidden altered ego. 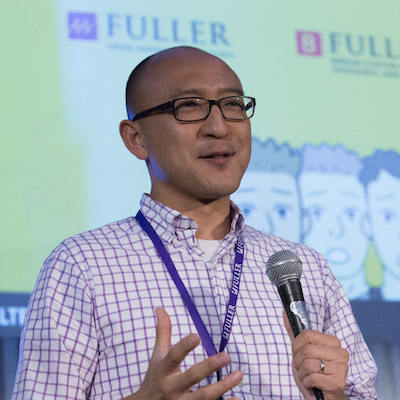 This conference explored how recovering one’s Asian American identity can become a source of creativity, insight, and strength for Christian discipleship and calling.” Read more from Daniel at the conference’s co-sponsor Inheritance Magazine. + Nate Risdon, associate director of the Brehm Center, from an interview on faith, art, and leadership on Faith & Leadership. Pictured above: Nate (far right) walks with immersion course participants through the streets of Austin, Texas, at the South by Southwest music festival.